Bringing peace through determination and transmutation. Uriel is here to help with your inner conflicts. If you feel irritated and angry, struggle to to ‘switch off’, can't sleep or have volatile relationships, Uriel is here to purify your solar plexus of discord and fill you with peace and tranquillity. Uriel is associated with stress so call him forth if you are in search of inner peace and release from worry and fears, or to bring peace to the world and end international conflicts. He is also the protector of Psychics and Magicians. 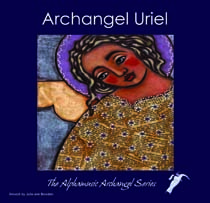 Uriel is the angel of the north and governs the element of earth, helping you to stay ‘grounded’. Remember, the stronger your connection to earth the higher you can fly.